Artists Bek Berger, Dan Koop and Kieran Swann first conceived Independent Convergence in May 2015 as a day-long conference where independent artists could form a creative community that thinks differently. 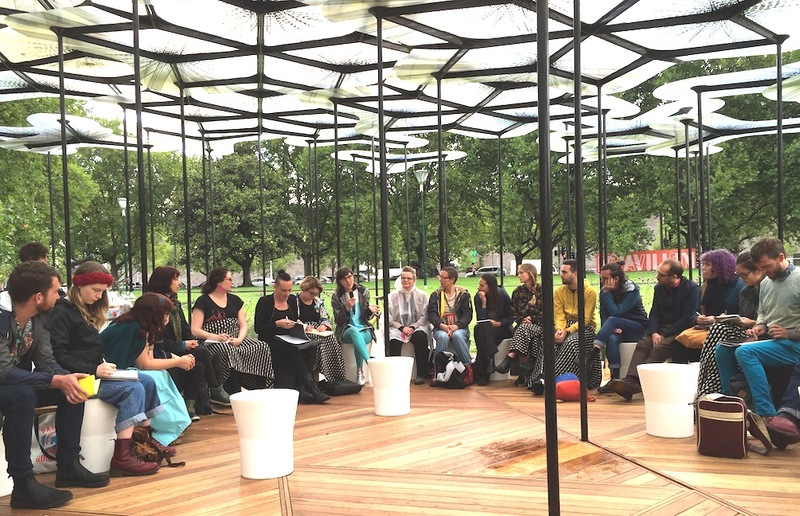 They then brought it to us at MPavilion 2015. Now with some new additions to the line-up this all-day MTalks has new questions to ask and new frontiers to explore. The panel will talk about the importance of independent practice. And how convergence is a time to meet and investigate the realities of being an independent artist in Australia. The conversation will focus on ‘responsibility’. In a connected world, what is our responsibility to the local spaces of our daily lives, and the global spaces that influence our lives? In a complex society, what is our responsibility to the communities that we belong to, and the communities around us? In a place where many cultures meet, what is our responsibility to the tradition(s) that we’ve inherited, and our responsibility to experiment? In a fast changing world, what is our responsibility to maintain personal consistency, and what is our responsibility to adapt and respond? Join writer, critic and curator Esther Anatolitis, curator and creative producer Bek Berger, writer, educator and social entrepreneur Julien Leyre, and writer, editor and radio producer Izzy Roberts-Orr for a day-long symposium that explores artistic responsibility in a connected, complex world. Click the booking link above to find out more and register your interest for the day.